Destiny 2 dominated much of the conversation within the gaming industry after its gameplay premiere last week. 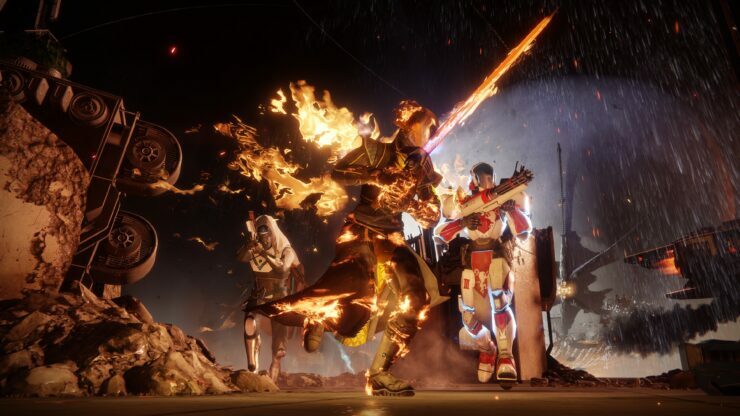 A big debate arose around Bungie’s decision to stick with 30 frames per second even on enhanced console hardware like Sony’s PlayStation 4 Pro. I wrote an op-ed detailing why Destiny 2 could and should have been running at 60FPS at least on PS4 Pro and Scorpio, though there’s an aspect I didn’t add into my analysis – offloading physics and AI to a dedicated servers setup in the cloud. I assumed that could have helped with the 60FPS goal, though lacking the expertise for such a statement I preferred to leave that out. However, Glenn Fiedler is more than qualified for this particular matter, having been Multiplayer Lead at Pandemic Studios, Lead Network Programmer at Sony Computer Entertainment and most recently Senior Programmer on Titanfall and its sequel – two games that relied heavily on the cloud and dedicated servers. You might recall that he was the one who famously pointed out the specific faults in The Division’s netcode with a blog post titled ‘Never Trust the Client’. Fiedler, who is now a consultant “for teams who need to network their game”, wrote in a now deleted tweet that Destiny 2 could have run at 60FPS on PlayStation 4 Pro by offloading physics and AI calculations onto cloud based dedicated servers. While there’s no snapshot of the tweet, the folks at Digital Foundry mention it during their Destiny 2 PlayStation 4 First-Look and Frame Test video (around 5:40). The lack of dedicated servers is, of course, another big letdown for many Destiny fans and even more so for PC gamers who are very much used to having them. Bungie openly said that it was an investment they decided not to make. While setting up dedicated servers for a game this large would have been costly, it could also have helped in delivering 60FPS gameplay on consoles. We’ll have to see whether Bungie and Activision’s choice will prove wise in the long term. Destiny 2 launches on PlayStation 4 and Xbox One on September 8th. The game will also be available on the PC with an uncapped frame rate at a later date.